The Travelin' Rat is going places! If you are interested in hosting Trek during 2018, please email Trek, The Travelin' Rat. Include your name, address, phone number, any dates that you may like to host him and any days that are particularly bad for you. We try our best to schedule him for the requested dates. PLEASE let us know as soon as you find out if there are any problems with mailing him out when you are expected to, as this is not fair to other hosts if he is not mailed off on time. Trek is The Travelin' Rat's traveling rat! Trek was generously donated by The Crafty Rat and is ready to embark on a fantastic journey around the world to make people aware of who we are and what we do. During his travels, he is planning to meet many friends and rat fans who are willing to take him in and show him around where they live. Hopefully this little ambassador will also be able to educate those individuals that he comes into contact with who do not already know about the virtues of pet rats or the plight of animals in shelters and rescues. We have a few simple requests for those who have decided to host Trek, The Travelin' Rat. When sending Trek to his next destination please keep in mind the weight of the package and try not to send any items that are heavy. Please do not include any liquids or other items that may damage the doll and other contents. Please do not include items that may slow down transport through customs as he will be traveling overseas. Also note that any items arriving or departing with The Travelin' Rat Doll become the property of The Travelin' Rat and will not be returned to the sender. 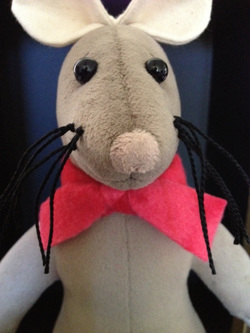 By receiving The Travelin' Rat Doll you agree to abide by all of the program rules including the payment of shipping costs and mailing at the scheduled time. If you have any questions or concerns please contact The Travelin' Rat.